PALM BEACH, Fla. (AP) — An internal White House quarrel over the timing of new Russia sanctions played out in public when the new economic adviser suggested U.N. Ambassador Nikki Haley was suffering from "momentary confusion" and Haley retorted: "With all due respect, I don't get confused." 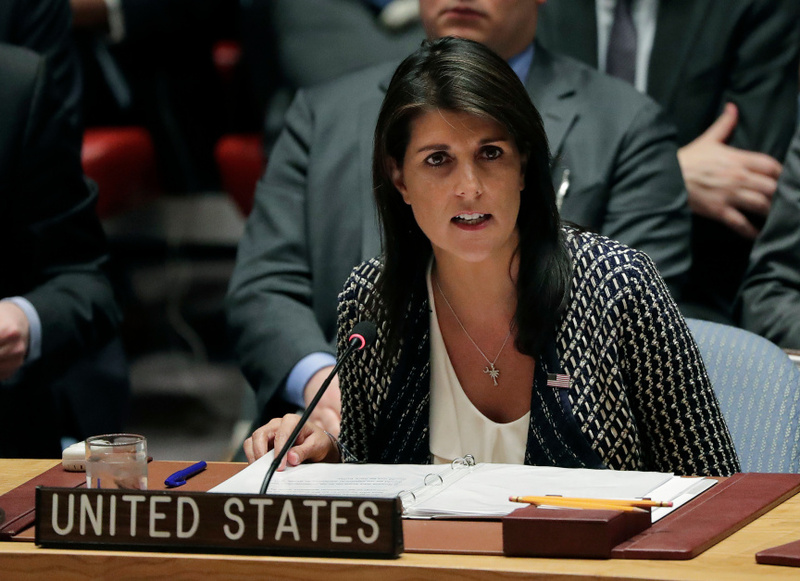 The feud appeared to quiet down after the economic adviser, Larry Kudlow, called Haley to apologize Tuesday afternoon, a White House official said. The official spoke to The Associated Press on condition of anonymity to describe private discussions. Earlier Tuesday, Kudlow told reporters during a briefing in Florida that Haley "got ahead of the curve" when she said the U.S. would be slapping new sanctions on Russia on Monday in retaliation for the country's support for Syria's Assad government after its latest suspected chemical attack. Kudlow, the director of the National Economic Council, said additional sanctions are under consideration but have yet to be implemented. Of Haley, he said, "There might have been some momentary confusion about that." Haley then issued a terse statement to Fox News: "With all due respect, I don't get confused." The dispute between Haley's team and the White House had been playing out largely behind the scenes since Haley said Sunday on CBS' "Face the Nation" that Treasury Secretary Steven Mnuchin would be announcing new sanctions directed at companies associated with Syria's chemical weapons program on Monday, "if he hasn't already." The White House had been struggling to explain Haley's remarks amid reports that President Donald Trump put the brakes on the new sanctions. Several administration officials have disputed that characterization, saying Haley was out of the loop. Three senior administration officials said there were several attempts to get Haley to back off or clarify her comments, but she refused. The officials said that, under the plan conceived last week, the sanctions would have been announced Friday night, at the same time U.S., French, and British forces launched a missile strike on Syrian President Bashar Assad's chemical weapons facilities. But the sanctions were not ready in time for Trump's Friday night statement, so they were delayed. The officials said a decision was then made to announce the sanctions as an answer to Russia's response to the strikes. But that plan was re-evaluated and then put on hold over the weekend as it became clear that Russia's response was less robust than anticipated. The officials were not authorized to discuss private administration deliberations publicly and spoke to the AP on condition of anonymity. A National Security Council memorandum sent overnight Friday said the new sanctions would be announced soon, but it did not specify a date. Over the next 36 hours, officials began to delve deeper into the proposed sanctions and decided to hold off on anything imminent, but Haley was unaware, the officials said. On Monday, a new memo went out from the NSC saying that additional sanctions were under consideration, but no decision had been made. In the face of Haley's refusal to clarify on Sunday, draft language was sent to her suggesting again that she do so, the officials said. Haley and her office ignored that so the White House decided to push back, the officials said. On Capitol Hill, House Speaker Paul Ryan, R-Wis., applauded the administration Tuesday as having "moved miles in the right direction" on Russia policy. "Not only did we scuttle the reset, not only are we now sanctioning Russian citizens, not only are we sanctioning Russian oligarchs, we're sanctioning Russia itself. We have so improved our policy with respect to Russia, far more hawkish, far more realistic," he said.